The 2014 FEI European Pony Championships are taking place from Wednesday, July 30th to Sunday, August 3rd 2014 at the Green Glens Arena, Millstreet, County Cork, Ireland. The Championships consists of the FEI European Pony Dressage, Eventing and Jumping Championships and GB sends teams to compete in each of the disciplines. 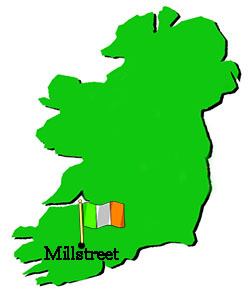 The Green Glens Arena complex is an established, top class venue which hosts the annual Millstreet Horse Show. The existing facilities include 8 all-weather jumping arenas and the same number of all-weather warm up arenas plus 3 indoor schools and 1,500 stables. Green Glens was set up by the Duggan Family in 1973 and as well as the top class equestrian events, it also hosted the 1993 Eurovision Song Contest! As part of the continuous development of the facilities, the centre's first Cross Country Course is being constructed for the Pony Euros and it will run through the grounds of the 15th century Drishane Castle which lies to the North-East of the main site. The course designer is Mike Etherington-Smith, who was responsible for the cross country courses at both the Sydney and Hong Kong Olympics and the 2010 World Equestrian Games. The outline schedule is given below. For the latest information look at the European Championships website. British Showjumping has announced their squad of five riders (four will form the team and the fifth will ride as an individual). British Eventing has announced their squad of six riders (four will form the team and the others will ride as individuals). Chloe Bell (16) with Helen Bell's 12 year old gelding Strawberry Box (breeding unknown). Phoebe Locke (14) with her own 14 year old gelding Mr Otto (breeding unknown). Chelsea Pearce (15) , from Wiltshire riding her own 18 year old SPSS Elite graded mare Catherston Nutsafe (Catherston Nightsafe x Dutch Courage). Chelsea also has her own 9 year old mare Little Indian Feather (unknown breeding) as reserve. Thomas Tulloch (15) with Jancis Tulloch's 16 year old gelding Spirit VI breeding unknown). Isabelle Upton (15) with her own 14 year old gelding Alfie XI (breeding unknown). Isabelle also has her own 12 year old gelding Howen Loganberry (by Faircross Sunrise) as reserve. Oliver Williams (14) with Ellie Wiliams' 10 year old gelding Bobnamara, (breeding unknown). Hector Baker (16) with his own 10 year old gelding Mohill Gypsy (breeding unknown). Felicity Collins (16) with her own 10 year old mare The Royal Guest (breeding unknown). The team of four will be confirmed at the Championships at the discretion of the Charles Owen Pony Squad Selectors. The team are supported by Charles Owen and the UK Sport funded World Class Programme. 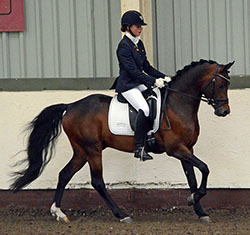 The British Dressage Pony Selectors have announced their team and reserves. Rebecca Bell with Caroline Bell’s 10 year old gelding Valido’s Starlight(Valido x Capri Moon)as a direct reserve pony. Liz Mills is Chef d’Equipe with Peter Storr as Team Trainer and the team vet is Robert Oulton. The team are supported by the UK Sport funded World Class Programme. 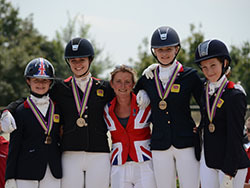 The British Dressage Pony Team Selectors dispatched the main team contenders to France for the Saumur CDI from 2-4 May. 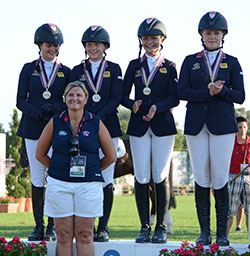 In Saumur, Phoebe Peters & SL Lucci were up against one of their rivals form the 2013 Pony Euros, Semmieke Rothenberger & Deinhard B, and the two girls fought for every mark during the competition. Phoebe triumphed in the Team Test, then Sammieke edged ahead in the Individual (but 2 judges had Phoebe to win), then once again Phoebe dominated the Kur. Good performances from the rest of the team, with all scoring over 70%, meant that GB were a mere 0.5 point behind Germany in the Nations Cup and Denmark took third place. won the Team Competition ahead of Switzerland & Belgium. In the parallel CDI classes, Rebecca Bell's second pony did well, wining the Team & Individual Tests then placing 2nd in the Freestyle. Five more combinations competed in the CDIP, with the exciting combination of British SPSS graded stallion, LE Chiffre & Lara Kuropatwa finishing best of the Brits in both the Individual (5th overall) and Kur (4th overall) classes in his first overseas trip. The first of the Viewing Trials for the Jumping Ponies took place at Chepstow International Horse Show, which was held at the David Broome Event Centre (Wales and West) from 1-5 May. There were 3 main Pony Trial classes, one on each day. 2013 Team member, Emily Ward, 14, was a winner in both pony and senior classes winning two of the four Pony Trial classes, including the Pony Grand Prix, with Wizard VIII. Described by Emily as "fast, careful and was on target", Dutch bred Wizard is by Okkie Trooi out of Cinnamon (by Sonny af Hojmark). With Emily believed to be targeting Junior classes and Jodie Hall McAteer said to be concentrating on the Children on Horses classes, the selectors will be looking to other combinations for this year's squad. The British Dressage Pony Selectors have announced a long list of 12 riders and 15 ponies as continuing to meet the criteria for selection for the 2014 Pony European Championships. Those on the list have achieved good results in recent competitions; however, the selectors may also consider other combinations if their results improve before final selection in early June. No less than 3 SPSS graded stallions appear on the list - their names are highlighted below. The Pony Trial due to take place at Withington Manor over the weekend of the 26-27 April was cancelled due to heavy rain on the Friday with more being forecast for over the weekend. However, the organisrs of Salperton kindly agreed to ad a Pony Trial to their schedule on 22 June to allow riders still needing to qualify for the Charles Owen Pony CIC* at Withington another chance. The Salperton class will run as a normal Pony Trial apart from the FEI dressage test will be used. On the 12 April, the lovely setting of Weston Park hosted the 4th Pony Trial. With 52 ponies entered, they were split evenly across 2 sections, so had different dressage judges but jumped the same show jumping and XC courses. With the optimum time of 4 mins 49 seconds proving achievable by nearly half the competitors, the dressage and Show jumping phases proved influential. The winners in Section E, Another Island (by Island Lad) & Jessica Thomas lead from the start and finished on their dressage score of 23 penalties. Both the 2nd (Noble Skyboy & Aurelia Marcus) & 3rd (Nono & Richard Coney) placed added 4 Show jumping faults to their dressage scores but had sufficient of a lead to maintain their places going into the XC and with both going clear within the time, finished in the same order. In Section F, winners Holly Needham and Barana Snow (by I Love You Meoldy) nearly completed on their dressage score, just adding one time fault in the Show Jumping to their dressage score. Barana Snow is an experienced international eventing pony with his previous rider, Pumbaa Goess-Saurau. The dressage leaders, Hector Baker & Mohill Gypsy (unknown breeding) had 2 fences down in the SJ but still finished 2nd and Felicty Collins & Winnal Bee Bee Banwee (by Rashma of Warren) had one SJ down and 2 time faults for third place. The veteran SPSS graded mare, Catherston Nutsafe (by Catherston Nightsafe) & Chelsea Pearce were the highest place combination to finish on their dressage score in 4th. Addington CDI (21-23 March) is always a significant event for the British dressage pony riders and with just 3 Dutch riders and 5 combinations from Ireland, British riders were the majority of the 22 competitors. As expected, 2013's golden duo of Phoebe Peters & SL Lucci (Lukas x Bazar) were the winners of each of the Team (76.026%), Individual (79.187%) and Kur (82.875%) classes. Phoebe & Lucci's score in the Individual was a new personal best for them. Taking second place in each of the test was Alexandra Hellings & Der Kleine Lord (Der Feine Lord x Chantre B). Alex & 7 year old "Lordy" also scored well over 70% in each of their tests as did Bethany Horobin & Gigolo () who were 4th in the Team test then 3rd in the others. Lara Kuropatwa and another 7 year old, the SPSS graded British bred stallion LE Chiffre also scored got good scores, with their best being 71.917% for 5th place in the individual test. Over the weekend of the 15/16 March, aspiring Eventing Pony Team riders has a choice of Pony Trials with one taking place in Lincolnshire and one in Somerset. In total, 30 ponies competed at Lincoln and 25 at Aldon. At both events, the top ponies had all run at the Oasby Trial the previous weekend. In Lincolnshire, just 2 of the competitors failed to finish although anumber withdrew before the start of the competition, deciding to run at Aldon instead. With the Oasby winners missing, Isabelle Upton & Howen Loganberry improved from 2nd at Oasby to win on their dressage score. 2nd placed Jessica Thomas & Another Island were however at their first ever Pony Trial as her brother Jamie did Pony Trials on the pony in 2013 (and they were 3rd at Weston Park Pony 2* in October). In 3rd, Isabelle Upton & Alfie XI were also doing their first PT for 2014, but they competed in PTs in 2012 & 2013. Fourth placed Xanthe Goldsack & Time for Fenella had been 3rd at Oasby. In Somerset, all bar 3 of the 25 ponies completed the event and none of these had any XC jumping penalties and 9 of them were within the time allowed with a further 2 picking up penalties for being too fast! The winners Thea Godding & Carramore Champ finished on their dressage score. A 12 year old gelding by Tubber Patrick, Carramore Champ & Thea had been 25th at Oasby the previous weekend. Second placed Felicity Collins & Winnal Bee Bee Banwee (by Rashma of Warren) had also been down the order at Oasby (22nd) and 3rd placed Hector Baker & Mohill Gypsy (breeding unknown) had been eliminated! Unusually at the Myerscough Premier League, the Pony Individual test took place first on Saturday 9 March, with the Pony Team test the following day. Although all of the 2013 Team & Reserve ponies were missing, the wining scores were still high with the SPSS Elite Graded stallion, 7 year old LE Chiffre & Lara Kuropatwa winning the Individual and another 7 year old, Der Kleine Lord winning the Team test ridden by Alexandra Helling. The first of the Charles Owen sponsored Eventing Pony Trials (PT) was held at Oasby on 8 March. There were so many entries that some of the more experienced combinations, such as 2013 Pony Euros Individual Chelsea Pearce, on Little Indian Feather rather than her 2013 ride, SPSS Elite graded Catherston Nutsafe, were put in the Open Novice class instead. Both Chelsea and Beatrice Walker-Kerr & Mr Vick, who were also in an Open Novice section, went clear XC with just a few time faults. 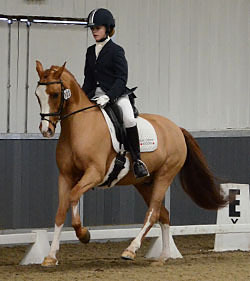 Mr Vick and his previous rider Libby Seed were members of the Gold medal wining GB team in 2013. The 44 ponies and riders in the PT were watched by the new Chief Selector Gray Parsonage and the Pony Trainer, Jonquil Hemming, who also did 2 XC and 1 SJ course walks. On these walks, Jonquil was advising the riders on the lines to take for fences, approach speed and other aspects like how to adjust for the ground conditions. She also told them that they weren't to worry about the time (of 3 minutes 39 seconds) at this trial due to the sticky ground conditions. The organisers had made an immense effort with the track, moving fences so that the ponies ran most of the way round on unused turf and using different fences and lines from the other classes. The PT course appeared to have been carefully designed to assess the ponies and riders with combinations requiring accuracy and the ability to ride turns without the fences being over high. An example of this as towards the end of the course, where after a long gallop, they had to jump a skinny, then a 90 degree right turn to a hedge, then a 90 degree left turn to another skinny. After the dressage phase, the leader was Richard Coney on the experienced FEI pony, Nono (Ned NF, Justice H.R. x Marnehoeve's Everest). Nono was a member of the Belgium team in 2009 and the Irish team in 2010, 2011 (Team Silver), 2012 (Team Gold) & 2013 (Team Bronze). However, 2 fences down in the SJ dropped them to 8th place and 6.8 time faults XC left them in 12th place at the end. Clear rounds in the SJ lifted Chloe Bell & Strawberry Box and Ivy Freeman-Attwood & Tarzan III into 1st & 2nd places with Isabelle Upton & Howen Loganberry and Hannah Graves & Sycamore Lad into joint 3rd places going into the XC phase. Either the time was tight on the XC or the riders heeded the Team Trainer's advice and didn't over push on the ground as there were just 2 combinations round in the time (Phoebe-May Nicholson & Llansteph an Brenin and Holly Osbourne & Popcorn de Fleyres). Overall, only 10 of the 41 who finished the course had less than 4 time faults. Chloe Bell & Strawberry Box were last but one to start on the XC, so had the advantage of knowing that she had 4 time penalties in hand over the leaders, Isabelle Upton & Howen Loganberry, who had added just 2 time penalties to their dressage score. Maybe taking advantage of experience gained on her first trip around the XC course with Feagh Delamain, Chloe rode Strawberry Box with determination and also had just 2 time penalties and so won the class from Isabelle & the British-bred New Forest Pony "Logan" in second. The next few places were also filled with combinations having fast clear XC rounds to make up for 4 faults in the SJ and Xanthe Goldsack & Time For Fenella finished 3rd. In 2012, Xanthe and Fenella were 2nd in the 5 year old section at the SPSS Young Eventing Pony Championships behind Chloe Bell & Feagh Delamain who were the Overall Champions. Time For Fenella is a British bred part-bred Welsh tobiano mare who is by the American Saddlebred Moonlight Hy-Color On Que out of the part-bred Welsh Llanshiver Demelza (by Penhest Tywysog (WPCS Sec D)). The only members of the 2013 Silver medal winning team still eligible for ponies in 2014 are Emily Ward & King Mac and Faye Adams & Some Like It Hot. Emily & King Mac have started 2014 well by winning a Winter JA Classic qualifier. They were also the winners of the Pony Showjumper of the Year Final at HOYS in October 2013. Emily has also been competing the 2012 Pony Euros Champion and 2013 Individual Silver medal winner, Song Girl (formerly ridden by Millie Allen). Faye and Some Like It Hot have also been competing successfully and have won £150 so far this year. 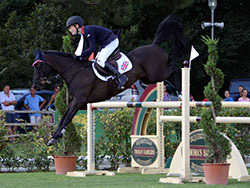 Ammanvalley Santino & Alex Gill competed at the 2013 Pony Euros as individuals and got through to the final individual rounds. Since then they've been 3rd in the Pony Showjumper of the Year Final at HOYS then started 2014 in style by winning 2 Winter JA Classic classes at the Morris Equestrian Centre in early February. Another 2013 team pony with a new rider is Lea Du Genier who has been ridden by Emma Shingles since November 2013 and they too have won a Winter JA Classic qualifier; Lea du Genier was second in the 2013 Winter JA Classic Final with her previous rider, Amy Inglis. Tixylix, winner of Team & Individual Gold with Zoe Adams in 2007 and regular team member with Jessica Mendoza from 2010 to 2012 (winning Team Gold in 2011 & 2012 and Individual Bronze in 2011), has been competed by Jodie Hall Mcateer since late 2012 and they competed at Neeroeteren CSIP (BEL) in November 2013, placing 3rd in the 1.30m GP and were also 3rd in a 1,25m class Enschede CSIP (NED) a week later. With the new pony team selectors, Pam Bushell and Andrew Harris observing the team test, the Under 25s Show at Keysoe attracted 17 proven and aspiring FEI pony riders. With all those selected for 2013 team (bar Erin Williams who is now too old) competing, it was unsurprising that they took the top places. There were also a number of proven ponies with new riders, like SPSS Elite sire, Bernwode Brokat, who was team reserve in 2013 ridden by Ruth Hole and is now being ridden by her 12 year old sister, Claire. Unsurprisingly, 2013 dual Gold medallists, Phoebe Peters & SL Lucci won both classes although he appeared somewhat nervous in the team test but this was his first competition since the Euros and he is apparently not as confident when competing indoors. Phoebe rode very tactfully and reassured Lucci when he was unsettled and this paid off in the following day's Individual Test when he looked much more confident. Second placed in the Team Test, Beth Horobin & Gigolo, were also competing for the first time since last summer and they too produced a good score, gaining over 72% from Spanish 3* FEI judge Rosa Garcia-Maurino and recently retired Chief Pony Selector, Jenny Ward. 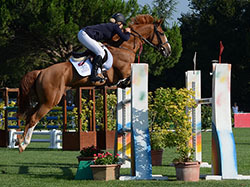 Rebecca Bell and her Pony Euros partner, Valido's Sunshine also scored over 70% to finish 3rd. With Beth & Gigolo only competing in the Team test, Rebecca & Sunshine moved up to 2nd place. Missing from the event for various reasons were the following members of the Pony Squad: Isobel Berrington (DHI Langar), Angus Corrie-Deane (Grayswood Orlando), Alex Hellings (Der Kleine Lord). The first of the High Profile Dressage Shows for 2014 attracted 17 pony entrants including 2 members of the 2013 Pony Euros team. In the end, 12 combinations started the Team Test and just 6 in the Individual Test and the Team Test winner, Der Kliene Lord, was one of those who only did the Team Test. Ridden by Alexandra Hellings for the second year, this 7 year old, recently gelded, pony is by Der Feine Lord who won Team Gold in 2009 for Germany out of Chantre's Lady (by Chantre B). The winner of the Individual Test, Ferrari (Mailbu II x unknown) is an experienced team pony having been part of the British Team in 2010 (ridden by Charlotte Gill) and 2011 (with Aimee Witkin). The British Showjumping Pony Team Selectors hold Viewing Trials to see the pony and rider combinations jumping at different venues. In addition, there are likely to be teams sent to selected Nations Cups. The British Eventing Pony Squad of 6 ponies and riders will be selected by Chairman of Pony Selectors Gary Parsonage and his team of selectors. Ponies must be between 142cm (14hh) and 148cm (14.2hh) in height without shoes. In a change from recent years, rather than mandating certain competitions, for 2014 the selectors have recommended that riders and their ponies that wish to be considered for selection should complete a minimum of 4 competitions during the 2014 season plus the CCNP 2 * at Brand Hall prior to the selection date of 7th July. The Selectors have reserved the right to select rider/pony combinations that have not fulfilled this recommendation if it is in the interest of achieving the Objective of the Selection Policy. As a guide for competitors, they as combinations should aspire to achieve an average dressage score of 65% or above, an average show jumping score of 4 penalties or better and an average cross country score of no more than 10 penalty points slower than the fastest time in the class. The full selection policy can be downloaded from the BE website here. * in order to compete at Withington, combinations must have successfully completed one of the first 4 Pony Trials. The British Dressage Pony Squad will be chosen by selectors, Sarah Pidgley, Pam Bushell and Andrew Harris and is normally announced soon after the last nominated competition. A key part of the selection process is the performance of ponies in the FEI Team Test, where they are expected to be achieving consistent results at 68% or above. In particular, the selectors expect the ponies to compete at at least two of the nominated competitions (list not yet published by BD) and also compete at the compulsory final trial which is traditionally at Wellington Premier League (6-9 June).